Our family-run coach company is more than 70 years old and still going strong. Jim and Edith built on foundation created by James Docherty in the post-war era and the good work is being carried on by their sons, William, Colin and Neil. 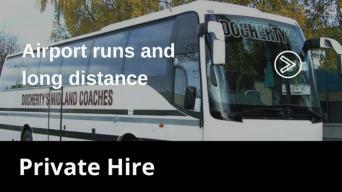 The business base for Docherty’s Midland Coaches remains Auchterarder, in the heart of Scotland, and easy access to the motorway network ensures 90% of the population is within a comfortable 90-minute journey. 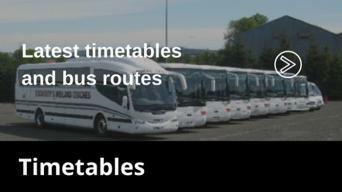 We have luxury coaches for every type of trip, seating from 16 up to 51 passengers and tailoring transport for group demands across the seating range. 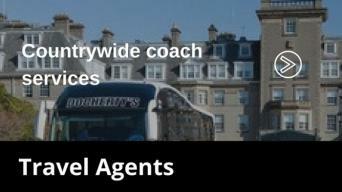 Few companies can match us for experience, planning expertise, flexibility and our reliable 24-hour, 365-day service. We have been called upon to transport passengers from the steps of “Airforce One” on the Prestwick Airport runway to The 2014 Ryder Cup at Gleneagles and Royalty but we take equal pride in ensuring the smoothest of road trips for all our clients in Scotland, the UK and beyond. Great value, comfortable and friendly staff. Relaxing way to travel free from all worries. Very friendly to deal with.